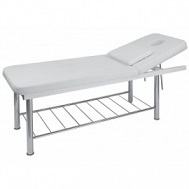 Item#-USA-2203.2-section static bed with a highly stable, sturdy chromed frame. The inclination of the backrest can be mechanically adjusted. Removable headrest with breather hole. White PU upholstery of high quality and easy cleaning.THIS STATIONARY CHAIR MUST SHIP BY TRUCK ON PALLET SO THAT IT DOES NOT GET DAMAGED. THIS DOES NOT SHIP FED EX OR UPS GROUND. ALL SHIPPING CHARGES ARE EXTRA,THESE SHIP CHARGES WILL NOT APPEAR ON YOUR INTERNET ORDER BUT WILL APPEAR ON YOUR INVOICE RECEIVED FROM US. 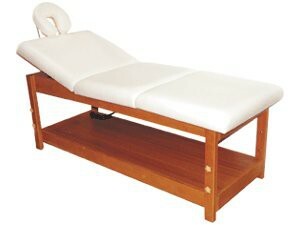 Item # Y-H-3730W“available in white only.“Full wooden massage bed with adjustable head / shoulder section. Beautiful wood storage area below.height from floor is 30′ high,30′ wide and 72′ long.“please note,shipping charges are extra.this will not appear on your internet order,only your invoice recieved from us. Item #USA–Suny 2201. 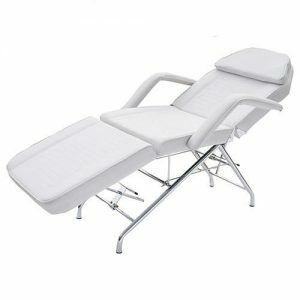 A 3-section static bed; backrest and leg rest can be adjusted to lay flat or be put into a more lounge position. The arms are removable and the pillow can be removed to reveal a facial hole. THIS STATIONARY CHAIR MUST SHIP BY TRUCK ON PALLET SO THAT IT DOES NOT GET DAMAGED. THIS DOES NOT SHIP FED EX OR UPS GROUND. ALL SHIPPING CHARGES ARE EXTRA,THESE SHIP CHARGES WILL NOT APPEAR ON YOUR INTERNET ORDER BUT WILL APPEAR ON YOUR INVOICE RECEIVED FROM US.